Atelier Oberto, “Open Studio,” designed by São Paulo’s AR Arquitetos, brings a studio's private interiors to the public in a series of design moves that break through the common moldings of public spaces that are suited to contain visitors, such as railings, entrance halls, and reception desks. Arising as a creative alternative to meet the front setback requirement of five feet, the building involves all aspects associated with a modern artist’s studio, from the creative to the official, and becomes an oasis of the humanities erected within the greenery of a public space, an idyllic gated village in beautiful São Paulo. Open Studio is grounded in designer Vivian Campos’ idea of the familiarity between volumes and courtyards, and the cuboid shapes associated with each. Open Studio both occupies the public space of courtyard, and visually depicts cubical buildings in a tetrad configuration. Some of the buildings are enclosed by the sleek concrete of modern urban architecture, others are left entirely open to elements, and others lie somewhere in between, for example, the thoroughfare between the two main sections of Open Studio is partially enclosed; though one wall is occupied by an enormous glass door, adjacent to a wall of windows providing sufficient light in addition; the corridor itself opens out into the square; and inside the corridor is an entirely separate “building,” small, with an awning that doubles as a rooftop gallery accessible via a small staircase. 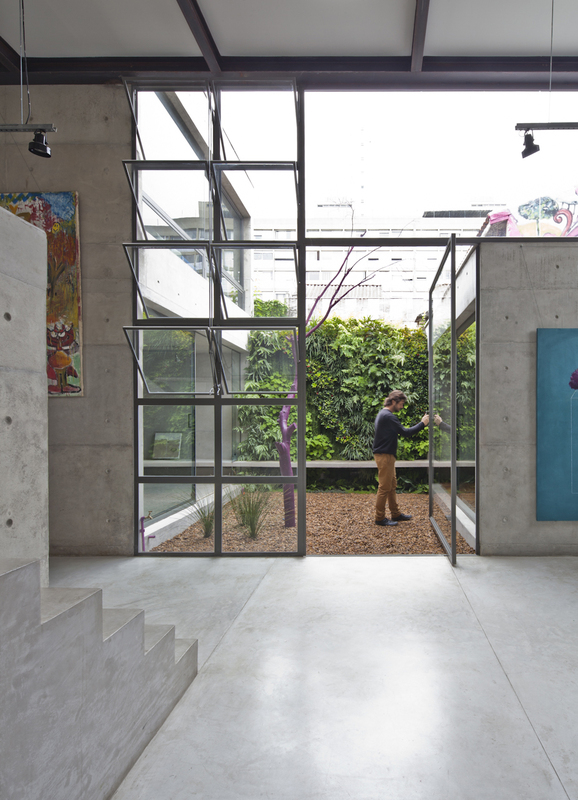 The capacity for volumes and inner-volumes of Open Studio are recognized and reachable, allowing the artist ample space to move and explore the interiors of his creative workshop. 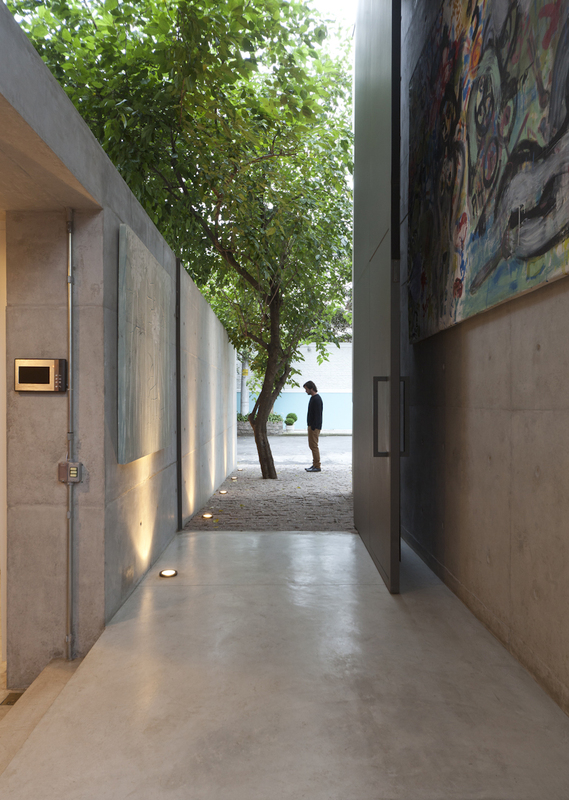 Its materials reflect those seen on crowded apartment streets in Tokyo: whitewashed concrete partitioned into rows, a reflection of artist Marina Acayaba’s acquaintance with Japanese architects Tadao Ando (Row House) and Sanaa (House Moryama), while the quiet sanctity of interstitial spaces–bed of wood chips, concrete bench forefront to a wall of vibrant shrubbery–between buildings at Open Studio don the appeal of zen garden. Their design schemes became appropriate to Acayaba’s consideration of an artists’ personal, unique, functional use of space to suit his or her creative needs. Interiors are catered in Open Studio with this in mind, allowing the large spaces necessary for painting and displaying work, but eradicating the confines of a normal studio to allow for inspiration to have a unanimous permeation, which having the interiors flow seamlessly into the world outside, provides for. Open Studio is configured within a semi-public square in a gated community, whose idyllic countryside appeal is readily apparent in its cobblestoned paths and intoxicating flora, and AR Arquitetos literally breaks down the walls of its design to allow the artist and passerby to seamlessly interact with each other, finding an architectural common ground between spaciousness of a courtyard, and the large interiors in which art is produced.